The National Summit on Women Veteran Homelessness brought together noted researchers, policy and practice experts, and women veterans with the lived experience of homelessness in a day and a half of facilitated dialogue sessions. Our purpose was threefold. First, we wanted to call attention to the growing national problem of homelessness among women veterans. Second, we wanted to better understand the unique challenges facing women veterans who have lost their homes or are at risk of homelessness. Finally, we sought to gather information and ideas for solutions to prevent and end homelessness among women veterans. Rich information was obtained from these sessions that will help us to understand the complex conditions that can result in women veteran homelessness, isolate the key areas where action to remediate the issues is required and create comprehensive and sustainable solutions that reduce the risk of women veteran homelessness and help those who are already homeless to achieve full reintegration into their communities. This report begins with a summary of presentations delivered by three experts who provided background on the demographics of homeless veterans, key programs at the U.S. Department of Veterans Affairs (VA), a research perspective on the challenges homeless women veterans face and litigation and advocacy as tools for change. 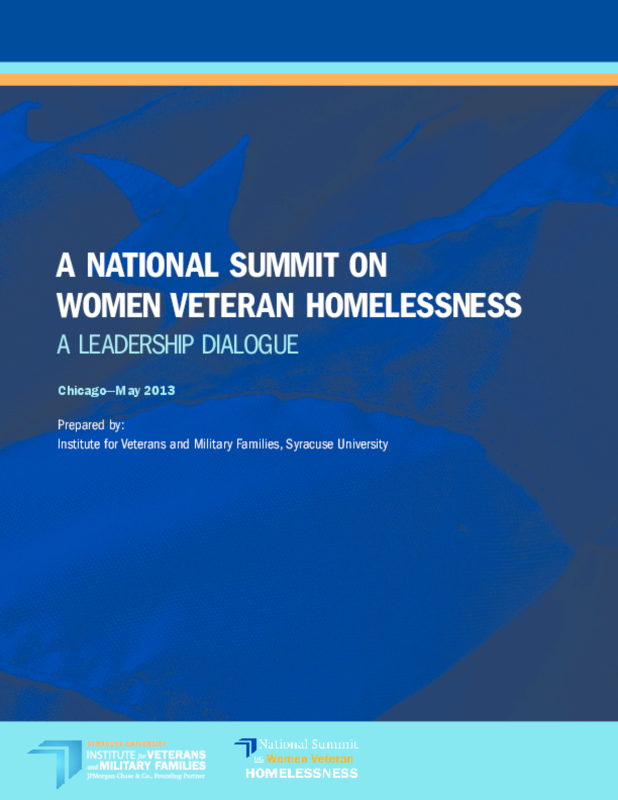 The core of the report, called the Summit Dialogue Sessions, summarizes three roundtable discussions centered on the following themes: 1) pathways to homelessness for women veterans; 2) strategies for exiting homelessness; and 3) approaches to preventing women veterans from falling into homelessness. The report then turns attention to the list of actionable tasks which grew out of the roundtables, as well as two facilitated "fishbowls" in which subgroups of Summit participants explored specific issues related to policy, practice and research. Together, these offer not only a record of the work accomplished at the Summit, but also a pathway to future research, policy and program initiatives that hold the hope and potential for preventing and ending women veteran homelessness. Copyright 2013 Institute for Veterans and Military Families, Syracuse University.